McGhee Tyson Airport (IATA: TYS, ICAO: KTYS) was established on August 1, 1930, to honor Charles McGhee Tyson, an American businessman and aviator from Knoxville, Tennessee. The land for the airport was obtained in 1935 and on July 29, 1937, the first plane landed at McGhee Tyson Airport. Later, in 1941, the control tower was built on the territory of the airport, as well as two 1.500-meter runways. In 1951, with the United States Air Force investment, a 2.300-meter runway was constructed. Furthermore, with the support of the Tennessee Air National Guard, the runway was extended to 2.700 meters. After the construction of the new passenger terminal in 1974, the Metropolitan Knoxville Airport Authority (MKAA) was established, which marked the resignation of two parallel runways 5L/23R and 5R/23L. In 1990 the runway 5R/23L was extended to its current length of 2.743 meters. Moreover, a new cargo facility was added in 1992, which became a house for Federal Express, UPS and Airborne Express. That cargo facility is now located on the north side of the terminal building. 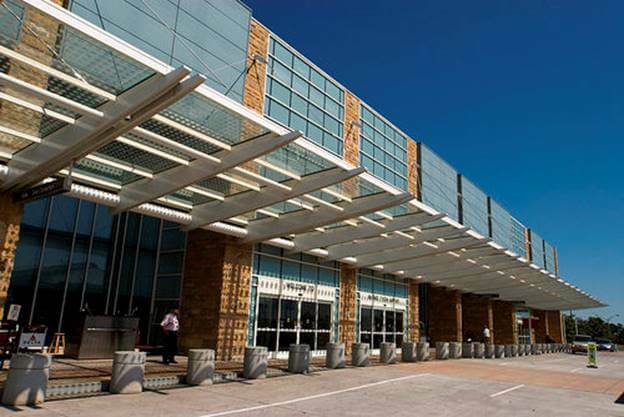 In 2000, the terminal underwent certain renovations that cost approximately $70 million. The expansions included the construction of 12 new boarding gates, a new concourse, ticket counters, and a food court. However, in 2009, new cafes were added to the food court, those included Cinnabon, Starbucks, Quiznos, and Zia. Notably, in 2016, the airport received a $27.9 million grant that is dedicated to a multi-year runway expansion. The runway 5L/23R is being extended to 10,000 feet. Approximately 3.000 feet of the runway was already demolished; however, 6.000 feet are still present to provide a landing ground for small general-aviation planes.